Tucked between Terres de 7 Couleur’s entrance gate and seven coloured earth is this another bounty of nature. 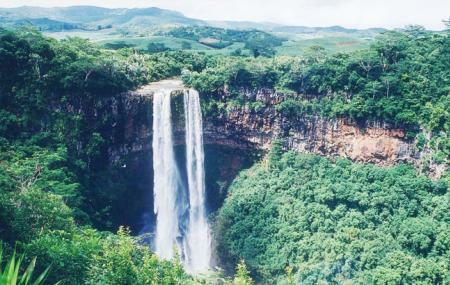 Chamarel waterfalls are a beautiful sight nested between already pretty surroundings. Thanks to the torrential and tropical rains of Mauritius, these waterfalls are never dry and plunge 95 metres in a single drop! With prior reservations you can take a tour down the waterfalls to its base pool! How popular is Chamarel Waterfall? People normally club together Chamarel Coloured Earth and Le Morne Brabant while planning their visit to Chamarel Waterfall. Well signposted and well maintained surroundings and access. Great viewing platform. Would suggest an early visit because it got busier and busier as the morning went on in terms of visitors. A must visit place when in Mauritius. Not far from the waterfall, the Seven colour park is as well a place worth a visit. I'd suggest to get there early in the morning to benefit sweet light (and cooler temperatures!). Great trip. Fun for family. Visit the ebony forest too for really great tour. Deep waterfalls. View only from platform. Entrance fee of 250 MUR paid at the main gate and includes also Seven Coloured Earth. You drive by your own car through the park. Beautiful large Waterfall in a great location. Definitely worth the visit.